EV 7.735, 1515 Ste Catherine St. W.
A two-day symposium, held in conjunction with the opening of the exhibit World of Matter: Exposing Resource Ecologies, at the Leonard & Bina Ellen Gallery, 1455 de Maisonneuve West. The world of matter has been forcefully sculpted in the last several centuries by the twin projects of colonialism and capitalism. The very movement of human activity under modernity has rested on the formation of a standing reserve of nature, a category whose flexibility has variously expanded and contracted to include both humans and non-human others as targets for exploitation and extractive energy. Carbon industries, forestry, mining, agri-business, construction, mega-farming and fishing participate in worlding the world as mere matter, asserting deep and unforgiving property rights in dispersed territories around the globe. Nevertheless, at each point in this cartography of extraction one finds committed points of resistance and unceded terrains, both material and symbolic. This symposium asks how the fields of contemporary art and media studies, indigenous studies and resistance movements, critical environmental studies, new ethnography and science and technology studies might bring into focus the globalizing dynamics of extractive ecologies. It seeks to build substantive discursive grounds for resisting incursions into sovereign land, denials of the rights of nature, and the persistent dispossession of indigenous and First Nation peoples. It asks, What unceded terrains precede and interrupt the excavatory depths of imperial ecologies? What interventions ensure the defense of land, labour, survival and species diversity in the globalized present? EV, 7.735, 1515 Ste. Catherine St. W.
This talk will critically examine the history and present of the Canadian prairie as an ongoing scene of extractive, capitalist, settler modernity. Focussing geographically on the Battle River region in central Alberta, I will discuss how the political economies and materialities of extraction have shaped not only the land itself but also the subjectivities and agencies of its various inhabitants. In particular, I will explore the role played by infrastructures for the storage and transportation of resource commodities, not only as technologies of extraction but also of political mediation and orientation. Finally, I will consider the agonizing, conflicted, material and political situation of being an extractive subject on the prairie. My paper examines how gestures to universality in Western law are grounded within and reproduce the geopolitics of white settler colonialism. Answering Indigenous critiques, and linking them to theories in black diaspora and postcolonial studies, I argue that the philosophical standing of Western law is achieved crucially through white settler colonization. Current global governance arose in direct relation to the occupation of Indigenous nations by white settler states, which establish themselves by enacting anti-blackness, Orientalism and Indigenous genocide and then naturalizing these power relations and Western law on global and, ultimately, universal scales. Citing critical theories and political cases, I trace how white settler colonialism sustains — as landed practice, or as part of global governance –whenever the white-supremacist and colonial authority and law of settler states is glossed as “Western”: whether this takes place “at home” or “abroad,” in political, economic or militarized interventions against racialized and colonized peoples. Frontiers are always manifested at the contact points between new areas of endeavour and the established realities of socio-natural environments. Consequently, their material agency is navigating both factual and speculative terrains. From Canada’s tar sands rush to the deep rainforests of the Amazon basin and from Chinese boomtown urbanism to seabed mining in the Arctic, many critical sites of resource exploitation are governed by frontier milieus. It is the combination of peripheral characteristics – geographical remoteness, demographic marginalisation, ideological oblivion – which enables processes to emerge that would not succeed otherwise. In our presentation, we aim to trace these forces and ideologies as well as the materialities and representations that allow for a frontier mentality to crystallize into action. Arguing that the frontier processes of contemporary resource ecologies are constituting an evolving mode of capital, we will discuss a range of frontier operations that form part of our work shown in the World of Matter exhibition – from Resource Cities to Ecological Capital and from Demiurgic Worlds to Conflict Matter. Through the preservation of tribal wilderness and sacred sites, the restoration of bull trout and grizzly bears, the regulation of right-of-way, and sustained resistance to extractive industries, the Flathead Nation in northwestern Montana defends not only the land, in a material sense, but also modes of relationality embedded in the land. In the process the Flathead Nation articulates new understandings of traditional territories and asserts decolonial forms of connectivity that rupture settler colonial structures. The intervention by artists and filmmakers into contemporary practices of resource extraction have played a crucial role in making publics aware of the energy systems on which modernity is dependent — and the short and long term consequences of this dependence. Awareness is one thing; creating an intervention that leads from awareness to political change is another. This paper will explore Brenda Longfellow’s groundbreaking film Offshore in order to investigate the troubled links between aesthetics and politics raised by attempts to visualize resource extraction for publics. OFFSHORE is an interactive web documentary and installation that explores the dark waters of the global offshore oil industry in the wake of the 2010 Deepwater Horizon explosion. OFFSHORE uses new modes of documentary storytelling available through html and the web to consider how environmental activism might appropriate interactivity and immersion as innovative mechanisms to speak to 21st century audiences. Produced in collaboration with filmmakers and journalists around the world, OFFSHORE is continuously augmented with additional stories from coastal communities in Ghana, Alaska, Russia and Brazil. This presentation will take viewers through a short exploration of the key design elements of the project while reflecting on the project’s methodologies and creative evolution. Plastic has become so ubiquitous in contemporary society, composing our clothing, buildings, electronics, and, of course, packaging, that critics have begun calling the present moment the Plastic Age. Indeed, it can be understood as the material substrate of advanced capitalism, the medium through which our dependency on oil permeates into the fabric of our everyday lives, surrounding and enveloping us with its smooth touch. This paper will address the historical emergence of plastic and the ways in which it shapes and informs contemporary petrocultures, exacerbating and revealing the processes of imperialism, colonization and environmental racism. Plastic creates a new geologic archive as it forecloses the living worlds of multiple life forms and forms of life on earth. Through the proliferation of plastics and chemical pollution more generally, petrochemicals constitute forms of social, material, and biological writing. How might contemporary literary artists respond to the capacity of these petrochemical hyperobjects to influence social formations or alter human metabolism? How do endocrine disrupting chemicals put pressure on literary forms and genres? Arguing for the critical potential of an ecopoetics that mixes science and art (through pataphysics and biosemiotics), this presentation will include a reading and a discussion about the poetics and research involved with two related books of poetry: The Polymers (an imaginary science project that combines the discourses, theories, and experimental methods of the science of plastic materials with the language and culture of plastic behaviour) and Anatomic (which involves chemical and microbial testing on my body in order to look at the way the outside writes the inside of the body). I will discuss the tetralogy of artworks produced between 2008 and 2014 that delve experientially into what waste can do through a technological art practice. Be it waste water treatments, atmospheric pollution or the waste landfill, they engage visitors in new sensations with residual matter. Using configurations of immersive sound, moving image, drawing and custom-designed software for lighting in a performative and installation practice, my artist research unit called Ælab created the four artworks informed by waste operations and processual philosophies. Forests think. This is neither a metaphor nor is it a claim specific to any “ontology.” What kind of claim, then, is it? What right do we have in making it? And what might happen to our social theory – and the human – if we take it seriously? The tropical forest of the Upper Amazon, one of the world’s most complex ecosystems, amplifies the way life thinks. In the process it makes over the thoughts of those who engage with its living logics – be these Amerindians, rubber bosses, or anthropologists. Ethnographic attention to how the Amazonian Runa interact with the many beings that ‘walk’ the forests – animals, but also the dead, and spirits – renders visible some of the strange properties of living thoughts that are occluded by the ways in which our distinctively human ways of thinking have colonized how we think about thought. Learning to think with forests is crucial if we are to hold open spaces where the sylvan thinking we share with all of life (a veritable pensée sauvage) can flourish – a form of thinking that is under dire threat in this, our Anthropocene. 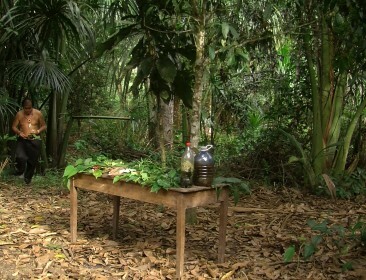 Forest Law is a collaborative video project with Paulo Tavares drawing on research carried out together in the oil-and-mining frontier in the Ecuadorian Amazon— one of the most biodiverse and mineral-rich regions on Earth, currently under pressure from the massive expansion of extraction activities. At the heart of Forest Law lies a series of landmark legal cases that bring the forest to court and plead for the rights of nature. 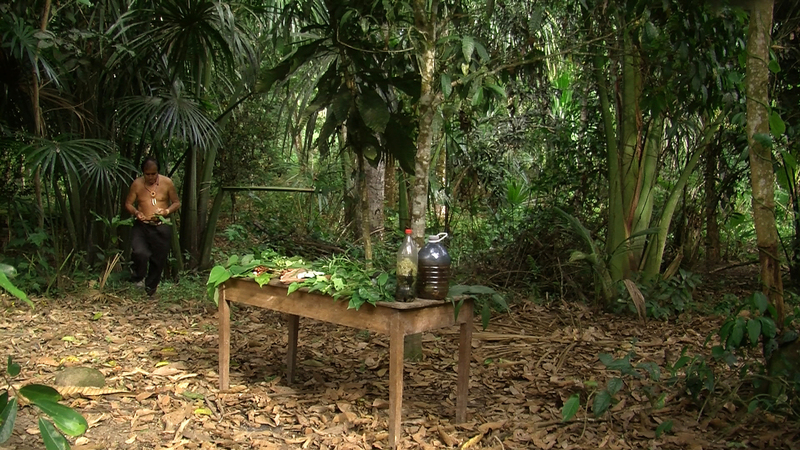 The artist talk will focus on one particularly paradigmatic trial that has recently been won by the indigenous people of Sarayaku based on their cosmology of the living forest, and reflect upon this new constitutional space where both humans and nonhumans gather in a political assembly. The vital function Amazonia has in the planetary climate is one of the multiperspective narratives constituting Forest Law. This paper considers how the concept of “natural resource” has been overtaken by a global armature in which bodies, substances, and sustaining energies are absorbed into a broader techno-corporeal machine that precludes physical sustenance or ecological sustainability. What counts as a primary or “natural” resource is now indistinguishable from its forms of deployment and distribution within wider procedures of “machinic heterogenesis” (Guattari), that are economically, aesthetically and ecologically charged. Thus, land, water, oil, plastics, and profit can all be considered equally as “resources”, though each has been schematized in terms of its relevance to systemic economic growth. Yet, the planet’s carrying capacity imposes limits on the terms by which resources are evaluated and imagined. I will explore how contemporary art visualizes the end of nature and the ideal of its resourcefulness, and the rise of a monstrous system of hypertrophic growth bound to bodily need and suffering. In emitting carbon dioxide in quantities that make seasons shift, temperatures climb and sea levels rise, humanity has turned into a geophysical force that impacts life on a planetary scale. Human transgression into the object world, has challenged the nature-human divide, and spurred reevaluations of accepted ideas and approaches in theory and the arts. What sort of action is required for humans and nonhumans to be equal actants in a shared world? This paper explores artistic methods that draw on participatory approaches from visual anthropology and alienation techniques of materialist cinema to search for realist ways of engaging with others. The film Episode of the Sea, presented in the exhibition World of Matter, presents the first stage of this research. It reports of an intense collaboration of Van Brummelen and her long-term collaborator De Haan, with a Dutch fishing community in which they exchanged artistic authority for a wide ranging coauthorship. Peter von Tiesenhausen, For the Common Good? Peter von Tiesenhausen has been making his artwork in and around his home for decades as well as for art galleries, museums, private and public places throughout Canada and abroad. His lifelong commitments to his work, land and community have left little room for compromise. In this talk he reflects on his view that by committing to one place for the duration of a life, one begins to notice where true values lie, what adds and what erodes future potential. With that understanding Peter and his partner became engaged in rebuilding community by promoting events, and through the construction of a timber frame and straw bale community centre in remote northwestern Alberta. His tiny community is presently thriving. Icebergs at present are living a second life on screens. The purpose of this telegenic life on screens is largely confined to determining how, and under what conditions, icebergs can be made a source of potable water for the planet. As such, they constitute a little-known touchstone in historical and contemporary debates on the ethical and ecological limits of the extractive industries. Actors in that industrial world of extraction, have, for well over a century, sought to move icebergs from their points of origin, calving off of glaciers and ice sheets in both the Arctic and Antarctic, to lucrative markets in Chile, California, and Saudi Arabia, amongst other countries. As this paper will argue, to come to know icebergs today we have to come to know how and why they are appearing on screens — how they constitute what could be thought of as media environments in their own right. Undersea cables are a critical material base that not only supports the circulation of transnational media, but also facilitates the extraction and deployment of resources around the globe. These systems shape conditions of possibility for the world of matter, as they both carry signals that speed up regimes of extraction and directly entangle the ecologies they run through. This presentation will focus on the residual uses of cable technologies, from the United States’ use of cables in their militarization of seafloor to the systems that connect offshore oil platforms. Cable systems are even being employed to directly interface with the ocean: cable observatories now collect video of undersea creatures, global temperature data, and records of submarine landslides. In traversing the aquatic lives and afterlives of undersea systems, the presentation posits distribution technologies not simply as a mode of connecting end-points but a form of environmental transformation. Tax havens have separated the territories where accountability is required from those where industrial activity takes place. Specifically, they have allowed the multiplication of discrepancies between sites where pollution is created and people are harmed for the purpose of exploiting workers or extracting natural resources; sites where the wealth produced through these methods is free of tax; and sites, finally, where there are laws governing human or ecological rights. This presentation will focus on three complementary types of jurisdiction: Mali, where mining exploration and exploitation projects are carried out; Canada, where 75% of the world’s mining companies are registered; and Barbados, where Canadian multinationals officially transfer their assets to avoid taxation and also to avoid, to some extent, the enforcement of specific laws. This presentation will consist of projected material from the archives of the Swiss traveller and geographer Edgar Aubert de la Rüe, held at the Museum of Ethnography in Geneva. In 1954, De la Rüe published Brésil Aride: La vie dans la Caatinga, a narrative exploration of the ‘drought polygon’ in Brazil’s Northeast. Lesser known than Brazil’s tourist coast and Amazon forest, the Caatinga is the only biome exclusive to Brazil. It occupies over 10% of Brazil’s territory and remains largely unprotected, and thus has been quickly degraded. Beginning with the vision of Caatinga first experienced through the Swiss archives and through translating Brésil Aride into Portuguese, the presentation will spin a narrative of the region’s contemporary mineral explorations. This presentation will use Dwayne Donald’s concept of “Indigenous Metissage” to explore how translocal storytelling has become increasingly crucial in bringing local and indigenous experiences to bear on decisions about North American oil and gas development. Such storytelling, whether about oil and gas drilling in the calving grounds of the Porcupine caribou, or about communities in the pathways of recently proposed oil sands pipelines, brings divergent worldviews into conversations, opening up individual and public perceptions through a “task of decolonizing …[in which] Aboriginal peoples and Canadians face each other across historic divides, deconstruct their shared past, and engage critically with the realization that their present and future are similarly tied together.” (Donald, 2012:535). Evolving multi-media platforms and practices give social purpose storytellers, ranging from indigenous governments and co-management boards to independent filmmakers, new tools to engage local communities at every step of the storytelling process and to tie this work to broader public engagement campaigns. “Reconciliation” has achieved a seemingly unquestioned status in Canada as the good thing that is to usher in the better thing that will be. That “better thing is a repaired past, a better future, an ethical, and balanced present. This move to reconcile has emerged from three decades of overt and unambiguous Indigenous foment, resistance and refusal in the face of neoliberal and dispossessive settlement and statecraft, statecraft that is now manifest and embodied in especially unambiguous ways by Stephen Harper’s Conservative government. It is his government however, that ushers the twin move of official “reconciliation” and simultaneously violent resource extraction and although on a continuum this moment appears as an apogee of sorts. Nonetheless, this discourse of repair was inaugurated by an official apology for one state violence, that of Indian residential schools and in this atomizing and reifying move, now finds its ways into legal decision on land rights (Tsilhqot’in Nation v. British Columbia, 2014), institutionalized spaces of listening (The Truth and Reconciliation Commission 2008-2014), but also circulates through various publics in a manner that can perform in supple and dexterous ways, different meanings. Although multi-vocal the discourse seeks to harmonize and balance a fundamental disjuncture: a sovereign state, in Dale Turner’s argument (2006) that was and is unwilling to rescind its (false) claims to Indigenous land and life and Indigenous struggles for land and life (as sovereignty). This paper is animated by the abbreviated history just described and examines the ways in which “reconciliation” seeks to repair or perhaps subvert and mask the problem of historical and ethical impasse and injury. The paper stages its argument with recourse to ethnographic conversations with those who stand in active critical, ethical and political relationship to the project of reconciliation. This symposium was made possible with generous support from the Austrian Cultural Forum, the Canada Research Chair in Feminist Media Studies, the Canada Research Chair in Technology & Citizenship, Concordia University, the Feminist Media Studio, the Fonds de recherche société et culture du Québec (FRQSC), the Hexagram International Network for Research-Creation in Media Arts, Design, Technology and Digital Culture, Media@McGill, Pro Helvetia, the Social Sciences & Humanities Research Council (SSHRC). "); var caption_text = $(".gallery-item").eq(0).find(".wp-caption-text").html(); if(!caption_text) caption_text=""; $("body").append("